The Eland was developed from the French Panard AML 90 light reconnaissance vehicle which was produced under license in South Africa. Since it being taken into use by the South African Army in the early 1960s the vehicle has been incrementally improved. In the latest Mk7 configuration a new engine in a power pack configuration and transmission has been fitted. Other changes include a new turret and a lengthened hull to accommodate the South African soldiers’ longer legs. 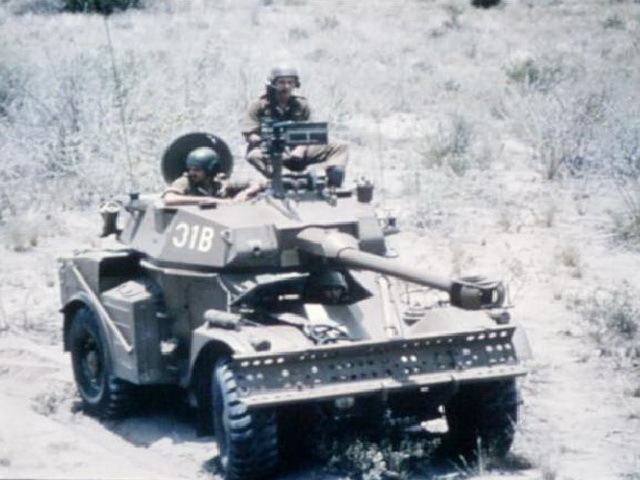 Although the vehicle, as previously stated, was intended to serve as a light reconnaissance vehicle, the South Africans employed it as an assault gun in support of the armoured assault columns striking at Swapo base camps during the Border War. It was also used to tackle the T34 tanks deployed at later stages by Swapo at these camps. In this role the vehicle performed exceptionally well. Age has however, despite the continuous updates, caught up with this venerable vehicle and it has since the end of the war been withdrawn from service to be replaced with the more advanced Rooikat.